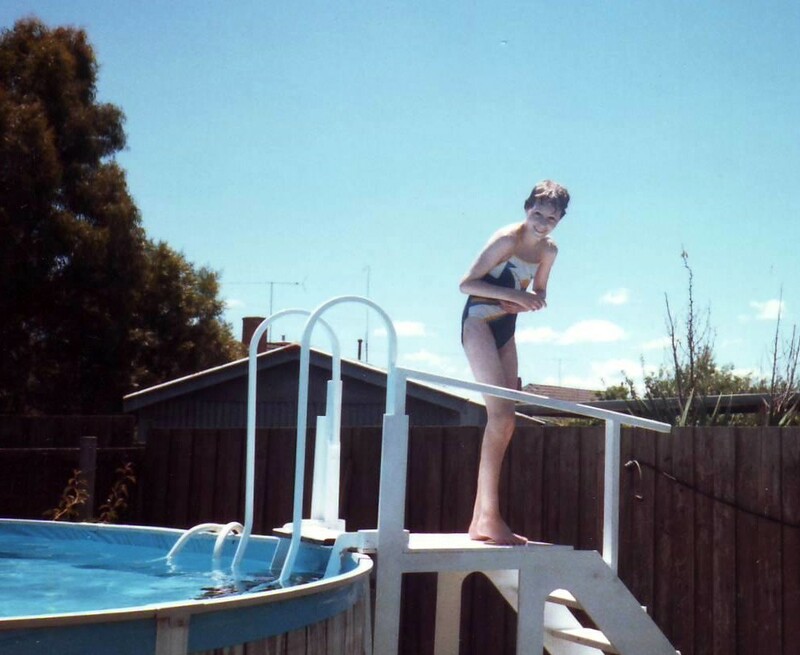 As a young girl, living with Scleroderma presented many challenges in life. Diagnosed at age 11, with the onset appearing more than 2 years earlier, I was barely at an age to understand puberty let alone Scleroderma. All sorts of strange things were going on in my body; hard, thick white patches of skin, tightening of my fingers, elbows and ankles. It felt like everything was swollen, but in fact it was just hard and thick. Growing up in rural Australia, I was the youngest of 3 girls with loving and adoring parents. My parents struggled just as much as I did with the diagnosis, and without the knowledge of city doctors around it felt like a see-saw of physicians – bouncing from one to the next. All sorts of creams and lotions were prescribed, and at one point I was told I was just allergic to the Sun so I must stay indoors. It wasn’t until we were referred to the ‘Big City’ in 1981 where life all changed for me, in more ways than one. A skin biopsy on my left thigh confirmed that I indeed had Scleroderma. Scleroderma initially affected me everywhere apart from my face, with my feet being the worst. My toes became deformed, and I was faced with recurring skin ulcers which took years to heal. At the age of 15, I was confronted with the first prospect of leg amputation. Here were my friends, thinking about dates, homework and school dances – where I was wondering if I would end up as an amputee. It was lucky for me that the leg was saved at that stage, however the continual skin ulcers and repeated skin graft surgeries over time became too much, and here today I am a bilateral amputee. High School was also hard. Holding a pen with curled fingers was a difficult task, making homework more of a chore than my peers. There were many hospital visits, prolonged periods of being away from school as well as my friends. However, life in hospital in the ‘Big City’ exposed me to a greater life experience where my love for big cities still continues today. New York! There is only one real ‘Big City’ in the world. I first came to New York in 2004, and have returned from Australia more than 18 times, so now it just feels like home. It is a city where there is always something new to do, and you never know what could happen. I like the element of surprise! No other city is as diverse, and I have been lucky enough to meet some amazing people. One of my favourite reasons for coming to New York is the shoe shopping. The novelty of being able to buy off the shelf shoes instead of having them custom-made is a reasonably new experience for me. The choice of shoes is great – as well as the price! New York is also an accessible city, in the most part. To me, this is something important. In facing what we face with Scleroderma, we don’t need additional barriers impeding our lives. Getting to work or to our medical appointments should be as easy as getting out of bed. Accessibility doesn’t just include physical barriers, it also includes attitudes and enablers in life and I have had some great experiences to showcase that in this city. Life with Scleroderma is hard, much harder than being a bilateral amputee. Today, I am a grown woman aged 44 and Scleroderma has presented itself in many forms throughout my years. After a few life-changing decisions, life has come to a stable point where I am enjoying new things which were not an option for me growing up. Simple things like, shoes, skirts, dresses as well as swimming. A general feeling of good health is something I thought I could never experience to the degree I am today. A challenge in life though is a test of your courage. We all have it in us, it is more just on how fate lets you bring it out. And how we get through our challenges is different for all of us. For me, it was having strong support from my parents from the get-go. It was a learning journey for us together, and my dad especially who was the rock in my world and still is today. This has made me realize that although we need support, we learn together. Giving back to others and sharing what may or may not work for you is always worth doing. It may not work for someone else, but if they don’t know – then they don’t know, and won’t be open to thinking of it as an option. Just as you give support, you are more likely going to receive it at the same time without really knowing it. That is why I have become involved in Peer Support (With amputees) and am a Disability Advocate. You give back to learn, and when you learn you want to create change. Scleroderma has brought about many life experiences for me but the one thing I will always say is that our tribulations would not be without our trials!